Click here for my WFMY News 2 interview about student debt, and its real worth. Somebody mentioned to me that politics and the presidential race is going on now. They said one of the main issues among candidates is student debt. In all seriousness, this political battle has been very interesting and I wanted to look a little closer at student debt as it is becoming such a hot topic among presidential candidates. 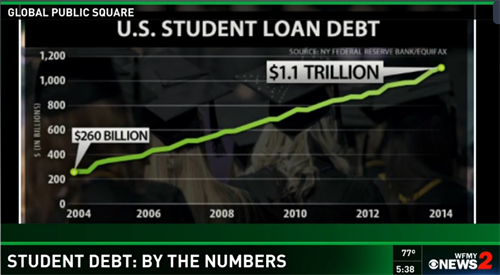 The Growing Problem: Prices Skyrocketing For Higher Education, Debt Too! Year by year, our higher education system has experienced skyrocketing costs to get that college degree. The other part is that we continue to preach to our high school graduates that you have to go to college. Combine this with the ease of getting a college loan and that is why we have skyrocketing student loan debt. Lets look at the numbers. The cost of getting a college degree has gone up significantly faster that the median household income as you can see in this chart. This chart is staggering. Look at the total student debt. In 10 years it has quadrupled from $260 billion to $1.1 trillion. That is why there are so many people talking more about the growing student debt problem. Many recent graduates are saddled with debt. Is Higher Education Always Worth It? In looking at this next chart, it shows how much education you have and compares it to the unemployment rate as well as the income rate. It does show that further education does increase your income. This is a pretty powerful chart to tell kids to further their knowledge as far as they can take it as it raises the chances of having employment as well as the amount of income you can earn. I recommend students look at education debt as an investment. This is an investment in your future. To that point as with any investment you would want to look at the expected return. While it is no guarantee, it will give an idea of what sort of path you could expect. Look below at the college degrees and how much they earn. While many of us expect those highly technical engineering degrees to earn higher, it is good to look at this no matter what your degree may be so that you can have a better understanding of the impact of your student debt and the ease or difficulty it may be to pay it off. Some people recommend never allowing your student debt to rise above half of your expected first year pay coming out of school. Another benefit of looking at your education as an investment is that by doing so, finishing school in four years becomes a much higher priority as the added cost of that 5th year can add to your student loan debt by 25%. Can College Freshmen Understand Debt? One problem that exacerbates the student loan debt falls on the borrower. Simply put many 18 year olds do not usually have the capacity to understand the magnitude of the long term nature of student loan debt in most cases. If you combine that with the relative ease in which someone can access the debt, you can have a situation where there are more funds than should be chasing around college education. In a way, there are almost too many ways to access funds for education with relative ease and that creates a higher demand for the education. The result is higher costs for education. Could we really be looking at a case where that is pushing costs up more than a healthy amount?